Advances in digital pathology are generating huge volumes of whole slide and tissue microarray images which are providing new insights into the causes of some of today’s most devastating diseases. They also present tremendous opportunities for developing and evaluating new and more effective treatments that may revolutionize the care of patients with cancers and other diseases. The challenge is to exploit the new and emerging digital pathology technologies effectively in order to process and model all the heterogeneous tissue-derived data. This requires joint research projects and collaborative programmes between academia and industry. Thus, biomedical scientists will be equipped with broad knowledge and tools of modern imaging and data processing as well as analysis technologies, whereas engineers with have an understanding of the complex disease processes and the clinical needs. This will help developing efficient and innovative products to fulfil the needs of digital pathology. The AIDPATH project addresses this challenge through a focused research, including research training aiming to knowledge sharing and career development in this emerging multidisciplinary field. 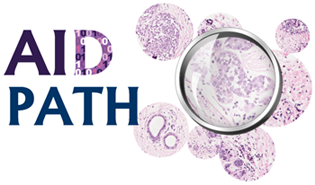 AIDPATH will research and develop: a) state of the art medical image display technology for digital pathology, b) novel image analysis solutions and knowledge discovery tools for future pathology diagnosis and research and c) state of the art solutions for biomarker evaluation and quantification. The first application will be breast cancer, though the applicability of the implemented methods and tools to other major diseases will be analysed. Gloria Bueno, Chris Womack, Dominique Segers, Rupert Ecker, Sean Costello, Vincenzo Della Mea, Eugen Carasevici, Mohammad Ilyas, Guoping Qiu, Marcial García-Rojo, Lucía González-López, Arvydas Laurinavicius, Gerald Schaefer.